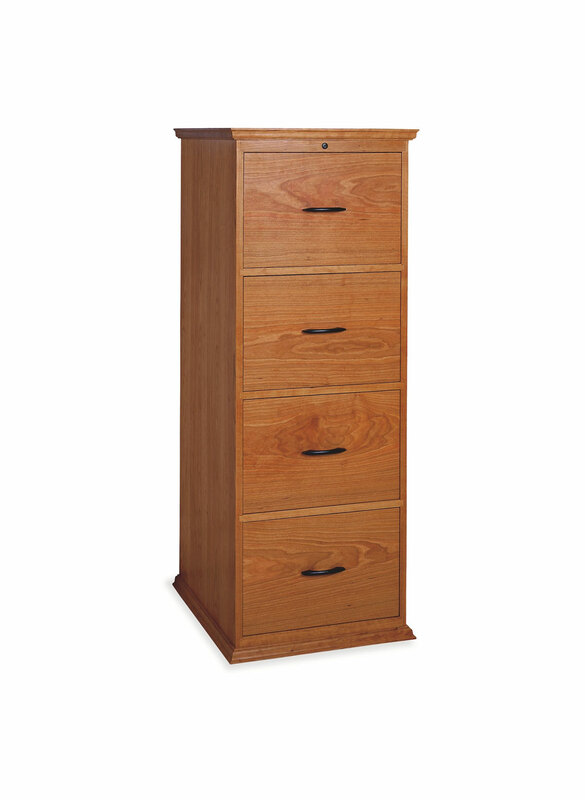 With drawers closed, the Four Drawer Vertical File Cabinet could easily be mistaken for a small dresser. On a visit to an antique shop, it’s common to come across wooden file cabinets salvaged from another age – and the Four Drawer Vertical File embraces that aesthetic. Unlike metal file cabinets popular today, the cabinet is a marvel in heavy-duty construction and as useful now as its antecedents were a hundred years ago. We’ve designed this beautifully efficient cabinet to withstand similar tests of time. Made of durable, grain-rich North American hardwood, it features a dovetailed top, traditional cabinetmaking joints and ebonized-metal drawer pulls. Four stacked drawers provide exceptional storage in a small space. The Four Drawer Vertical File achieves a warm, residential aesthetic. The cabinet offers all the accouterments required of a busy office while acknowledging the benefit of beauty in the workplace. Made of durable North American hardwood, the cabinet is distinct for its drawers – with intricate, grained faces that resemble dresser drawers. The drawers themselves support everyday office work. Designed to house the files of a busy home or professional office, they are fully adjustable to accommodate varying storage needs. Featuring a solid base that mimics the dimensions of its spacious top, the cabinet rises on either side in uninterrupted planes of grain-matched hardwood. Ideally suited for both a professional workspace and a home office, the Four Drawer Vertical File is our acknowledgment that work and austerity do not need to go hand-in-hand.